Tales of Frankenstein is an unsold TV pilot filmed in 1958. It was a co-production of Hammer Film Productions and Columbia Pictures. The film is a mixture of elements from both the Hammer and Universal Pictures versions of Frankenstein. The episode title, which does not appear onscreen, is “The Face in the Tombstone Mirror”. The film is in the public domain. Although the series was never produced, Anthony Hinds commissioned several scripts that provided Hammer with material for their later Frankenstein films. In one story by A.R. Rawlinson, Frankenstein created a beautiful woman with no soul (Frankenstein Created Woman); in another by Peter Bryan, Frankenstein hires a mystic to hypnotize the Monster (The Evil of Frankenstein). Hammer and Columbia planned to produce a series of 26 episodes, with each studio handling 13 episodes. 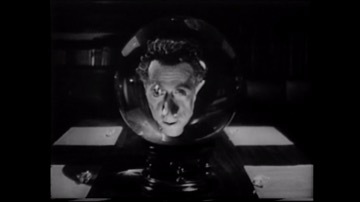 The producers wanted the series to be about Baron Frankenstein and his experiments. 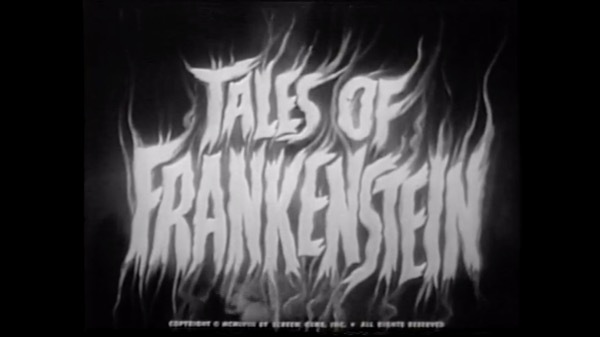 Director Curt Siodmak argued that “You cannot carry a whole show with nothing but Frankenstein stories. Michael Carreras intended the series to introduce Hammer to America, and wanted to give it a good chance. He enlisted Jimmy Sangster, fresh off The Revenge of Frankenstein, to write a pilot, “The Single Minded Black-Mailer”. Other writers provided five more scripts depicting an amoral Baron Frankenstein, in the Hammer style. Friction developed between the two studios because Columbia at that time held the TV rights to the Universal Monsters film series through their Shock Theater film package, and wanted to use that version of Frankenstein. Hammer, on the other hand, wanted to base the series on their own The Curse of Frankenstein. The only real input Hammer had was in the choice of Anton Diffring, who played Frankenstein very much like Peter Cushing. Diffring went on to star in Hammer’s The Man Who Could Cheat Death the following year. Since the series was intended for an American audience, Columbia rejected all six of Hammer’s scripts in favor of one written in-house. The film was co-written by Henry Kuttner and his wife C.L. Moore with Curt Siodmak, a veteran of Universal horror films including The Wolf Man, who also directed. Another script, “Frankenstein meets Dr. Varno”, was written by Jerome Bixby. The Monster was the flat-headed Universal Pictures version popularised by Boris Karloff, and was played by Don Megowan. Disgusted with their lack of input, Carreras went back to England, leaving Anthony Hinds to represent Hammer. Soon, he also gave up. There are two discrepancies in the credits at the end. The characters clearly identified as Paul and Christina Halpert in the film are listed as Max and Christine Halpert in the credits.